This is a mix of Callaway Golf Balls with the exception of Tour Balls. This group of Callaway golf balls may include the Big Bertha, HX Hot, HX Hot Plus, CXR, HX Red, HX Blue, CX3 Pro, CX3 Hot and the Rule 35 Golf Balls amongst others. 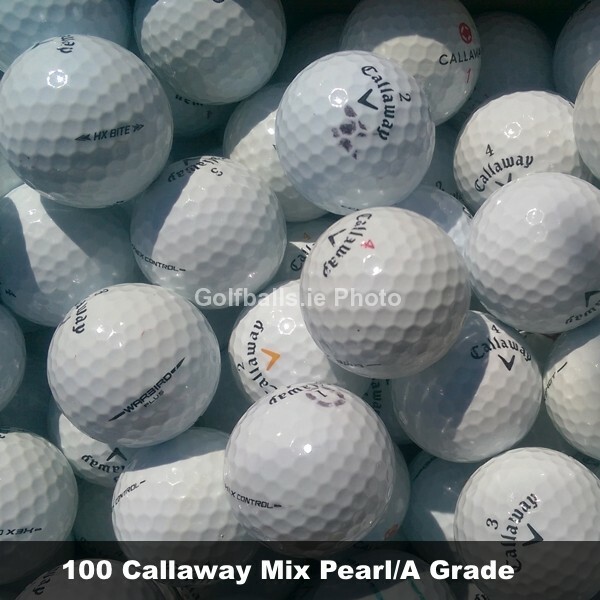 Please note: We can not guarantee any quantity breakdown of any particular style within this mix of Callaway golf balls. You may get some or all of the different styles mentioned above. The picture above is just an example of what golf balls you may get. Not all golf balls in this mix will be as shown in the picture. Our used Callaway golf balls are claimed from golf courses around Ireland, UK and the US. Please Note - None of our Pearl/A or B Grade golf balls are refurbished/refinished in any way, just simply washed in a nonabrasive cleaning solution.